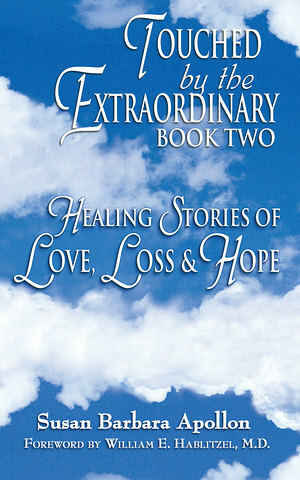 “Touched by the Extraordinary Book Two, Healing Stories of Love, Loss and Hope, is food for the soul – I simply could not put it down,” writes Christiane Northrup, MD. This beautiful gift book (with a padded cover) is by a psychologist who specializes in grief, trauma and illness. It is written to inspire and fill you with hope as well as provide valuable wisdom about navigating through loss. When you experience pain that accompanies losing a loved one, your health, job or dream, you hurt emotionally, mentally, physically and spiritually. Healing Stories of Love, Loss and Hope is a collection of unforgettable and miraculous real-life stories which reinforce that loss is more than pain and suffering. Grief is also a pathway to spiritual growth and the birth of hope, peace and joy. Included are inspirational stories of those who experience hope through signs and messages from deceased loved ones and pets, angelic encounters, near-death experiences, synchronicities and answered prayers. The author also includes in the Appendix her unique and valuable suggestions for healing grief and trauma.